I went thru this process 2 years ago. if you fish freshwater, electric is the only way to go. For saltwater use it’s a toss up. Not sure about Salmon, but my riggers are rarely fished deeper than 35-40 feet. Throw in the problems associated with electric motors, connectors and cable in a marine environment and they looked a lot less attractive. I’ve used electric downriggers for 10 + years for trout and salmon. Wouldn’t be without them. They get lowered and raised hundreds of times a year,and in over 10 years never a single problem.i have Scotty downriggers but Cannon are probably just as good. On occasion for Kokanee salmon I fish as deep as 140’ using 10lb weights, they always work smoothly. Yes you’ll be happy with electric downriggers. I’d suggest getting a separate dedicated battery for your DR’s. ‘Also if you are not familiar with downriggers I suggest you go out fishing with a guide who uses them and learn all you can from the guide. You can learn more in a day with a guide than you can in a year on your own. If you have other questions about DR fishing just ask. Big Jon hands down in my book, built tougher then Scotty or Cannon or Walker or Penn, used'um all. Cisco is even coping the basic design because they're so good..........Had Big Jon's for years now, own 5 downriggers and 2 planners, fish for Kamloops (Worlds biggest Rainbow), Dolly Varden (Bull Trout/Land Locked Salmon) Mac's ("Lake trout" but, really a huge Char), Chinook (Land locked), Kokanee (Land Locked Sockeye). Things have went up and down 1000's of times anywhere from 20/30' Kokanee to 200' and some for Mac's. Fishing friend of mine tells me he'll never use anything but Big Jon because his Big Jon downrigger saved his boat from sinking. Evidently, the boom and/or cable got hung up on the edge of the slip where his boat was moored, he had showed up one morning to his slip and his boat he said would have been at the bottom if it weren't for that Big Jon downrigger getting hung up as his boat was sinking........The boat he said, was suspended mostly sunk in the water but just hanging by that downrigger. He claims if it would have been any other downrigger he's used in the past, it for sure would have "snapped those plastic made things" and his boat would be gone. The high end Cannon are nice but, I don't particularly like solid boom design (pain to get clipped up), have to use weight retrievers and those are a pain sometimes. Last edited by sam am I; September 22nd, 2018, 10:47 PM. All the established brand name electric down riggers are quality pieces of equipment. They are all dependable, work great. The main difference is the bells and whistles they come with. Here on the west coast you see almost 100% Scotty or Cannon. On the East coast I think you may see Big Jon and others although Scotty and Cannon are popular across the US. Research each brand and get the one you think best meets your needs. Just last week I'm digging a line in rough wanted. The ball missed my noggin by a few inches and left a nice dent in the floor. Sold my Cannons and my Big Jons. Scotty only for me. I fish anywhere from 150 to 300 ft for Chinook and Coho. Can't run braided line on Cannons if you want the auto stop to function coming up. And the Auto Stop on Big Jon is a adjustable bead just like Scotty, can set the bead wherever you like, use it on braid, SS wire, whatever. Big Jon, un-like Scotty are direct drive motor driven, not toothed rubber belt driven that break/wear out and, Big Jon's don't require you to hang on to a hand brake all the while when getting down to depth each time. If you want to go down fast to 2, 3, 4, 500' in a free spool mode and hang on to a handle to whole while? On a Big Jon, you'd just have to hand loosen the drag knob, she'll rocket to the bottom or wherever you stop it at when you tighten the drag back up, but why? Seems simpler (albeit slower then free spooling) and way less overhead time to just hit a rocker switch into the down position for an electrical payout. I see some Scotty's on boats around here and messed around with a few but, don't get why there's any hype about them I guess. I just don't find any raving performance/technical gains or even enviro/mechanical advantages with Scotty. Last edited by sam am I; October 25th, 2018, 10:12 PM. I'm in the market for some manual downriggers. I don't need to go fancy with electric ones, as I only get to fish them a few times a year. My boat's a 16' Starcraft without a ton of room on it for big electrics. I will mainly be targeting rainbow trout and possibly some lake trout. My local lake is 180 ft. deep, but I probably won't fish lakers any deeper than 70-90'. Rainbows mainly, between 30-50'. I've narrowed it down to the Cannon Lake Troll and the Scotty Depthmaster. Both seem to have similar features, with the exception of the location of the line counter. Anyone used these two in particular and have an opinion? I have 2 cannon electric downriggers, and I love them. I don't use cannon releases though, I really like the scotty releases better. 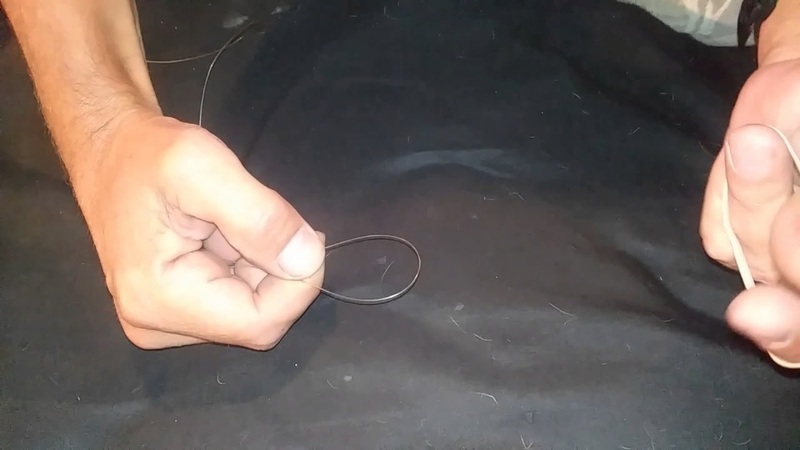 Any release (have used them all probably one time or another) that hard clips the fishing line to the down-rigger main line, doesn't typically allow, at least to some extend, the fishing line to either slide a bit up/down and/or stretch away from the main down-rigger line when a fish hits. Obviously this can mask a fish-on by not allowing the fishing line and the fish much movement to move away from the heavily weighed down down-rigger line (your video at 6:44). Esp. true if the fish is small'ish and/or the release doesn't break away. 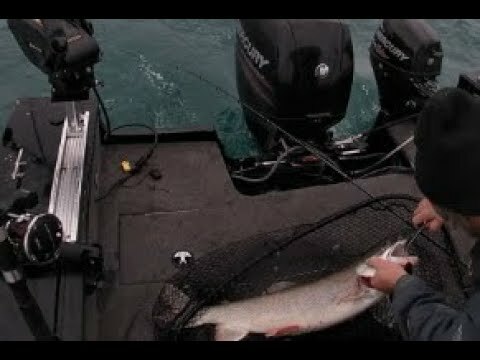 The band method/s sets up quick and allow much more movement to occurs between the down-rigger line and fishing line, which translates of course, when a fish hits, to much more obvious rod tip action. Bands can be adjust with thicker bands etc for bigger rigs etc. Try it, bet your rod tip would have been going crazy if you'd had a band on with that fish you had questioned was on or not.....Sometimes, that hesitation you had, can cost you fish. Last edited by sam am I; December 31st, 2018, 01:57 PM. sam am I said "Obviously this can mask a fish-on by not allowing the fishing line and the fish much movement to move away from the heavily weighed down down-rigger line (your video at 6:44). Esp. true if the fish is small'ish and/or the release doesn't break away." This is one of the reasons we have gotten away from down rigging here in our area of Lake Erie9North shore). Not that they don't work and work well it is the fish we have here. We have a fish called Silver Bass amongst some or White Perch according to The Ministry of Natural Resources here in Ontario, that's in Canada. They are also incorrectly referred to as White Bass. These little critters are not heavy or strong enough to release from the clip so you may drag them around for at least 30 minutes which is when we will check lines. The real problem is that they are reluctant to die on the line so they move port to starboard or towards the boat. This often results in them fouling all the lines and creating the Mother of all Carbuncklements. I had one trip a few years back that lasted a total of 10 minutes. 2 leadcore and 2 mono with leaders were a mess thst wasn't being untangled with out a sharp knife. After that no more down riggers. That isn't to say those things won't cross and lines not on a ball but for some reason it is less often. I now run the reel clickers at the lightest tension I can then listen like a Bunny Rabbit. I think they hear well. We hear one click and that rod is in hand and drag set. I have to get fishing soon, and I don't mean ice fishing, too tired, too sore and too old to even take the sled out on the lake. We have ice for the 1st time in 3 years here. Sorry can't seem to be able to edit. when I said no more downrigging I meant to say not as often. Especially as the water temps rise and fish go deep.